An independent Scotland would face “significant” challenges in its early years, according to an assessment by credit ratings agency Standard and Poor’s. A report found Scotland would benefit from an economy the size of New Zealand’s, with a highly skilled workforce and strong democratic institutions. But it cautioned the country would begin independent life with relatively high levels of debt and an economy that was sensitive to fluctuations in oil prices. It said Scotland would be an investment grade economy, a category it applies to sovereign nations rated BBB or higher. The UK has the top AAA rating. S&P said Scotland's GDP indicated it could qualify for the top rating. "Even excluding North Sea output and calculating per capita GDP only by looking at onshore income, Scotland would qualify for our highest economic assessment," the report said. It concluded: "In short, the challenge for Scotland to go it alone would be significant, but not unsurpassable." Deputy First Minister Nicola Sturgeon described it as “a hugely welcome endorsement of Scotland's economic strength from an internationally respected and independent agency.” But Better Together claimed the report undermined the Scottish Government’s currency-sharing plans. Standard and Poor’s (S&P) said that sharing the pound with the rest of the UK would be an advantage in terms of Scotland’s credit rating, but could limit its monetary flexibility. If Scotland failed to negotiate a currency union with the rest of the UK – an option that all three London political parties firmly oppose – the alternatives “could pose some initial risks” to external financing, S&P said. But it added that Scotland had the means and resources to run its own currency. "Specifically, we think Scotland would be hard-pressed, under a new currency regime, to quickly replicate the deep capital markets it enjoys today as part of the larger UK," the report states. "Nevertheless, with a GDP (including North Sea oil output) only slightly below that of New Zealand, a developed economy and developed financial system, there is no fundamental reason why Scotland could not successfully float a currency." It also said Scotland’s investment potential could be affected if banks left the country – but added this could have the advantage of reducing the size of the financial sector and the risk of bank bailouts. It said the "unusually large" financial sector posed a “significant contingent risk to the state”. “At the same time, a large part of this activity could be re-domiciled to the UK," the report adds. S&P said it was not passing judgement on the actual rating of an independent Scotland, and took no view on the merits or otherwise of independence. The report stated: "In brief, we would expect Scotland to benefit from all the attributes of an investment-grade sovereign credit characterized by its wealthy economy (roughly the size of New Zealand's), high-quality human capital, flexible product and labor markets, and transparent institutions," it concludes. "Nevertheless, the newly formed sovereign state would begin life with comparatively high levels of public debt, sensitivity to oil prices, and, depending on the nature of arrangements with the EU or UK, potentially limited monetary flexibility. "At the same time, Scotland's external position in terms of liquidity and investment could be subject to volatility should banks leave. Ms Sturgeon said: “This is a hugely welcome endorsement of Scotland's economic strength from an internationally respected and independent agency. "Standard & Poor's have concluded that Scotland's wealth levels are comparable to those of AAA-listed nations, and that as an independent country - even without North Sea oil - Scotland will qualify for S&P's highest economic assessment. "That is a glowing assessment of the Scottish economy from an impartial source and completely demolishes the scaremongering of the No campaign. "The anti-independence campaign was already guilty of massive hypocrisy on this issue following the UK's downgrading from AAA status by leading credit agencies, but this endorsement puts the scare stories to bed and is a massive endorsement of the Scottish Government's vision of a prosperous, economically successful independent Scotland." Blair McDougall, campaign director for Better Together, said: "The lack of a credible plan for what money Scotland would use has become the Achilles heel of the SNP's campaign. “Alex Salmond and the Yes campaign say we could use the pound without a currency union, even though their own experts ruled out this option. 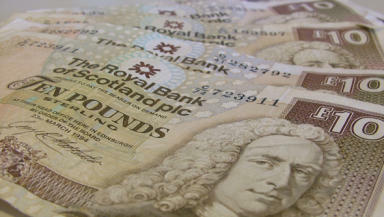 Now one of the top ratings agencies has said this would impact on Scotland's credit rating. "Coming on the same day the RBS and Standard Life raise concerns over the lack of a clear plan for currency in an independent Scotland, this will only further dent confidence in the SNP's already discredited currency plans."